On one sheet pan add only the potatoes and drizzle ¼ cup of olive oil and spread the potatoes in a single layer season with kosher salt and ground pepper. The potatoes will take 55 minutes in total. 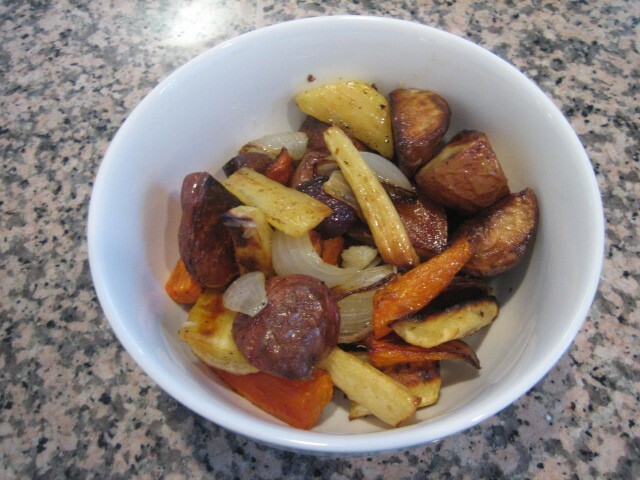 After 10 minutes on a separate sheet pan add the carrots, parsnips, and onions drizzle the remaining ¼ cup of olive oil and spread in a single layer and season with kosher salt and pepper and bake until crisp; about 45 minutes. Remove form oven and mix together and serve immediately.